One of my summer holiday reads is the mid-fifteenth-century allegory The Court of Sapience. It’s not the most appealing title, and the poem is not to everyone’s taste. The poem is a triptych of three episodes each centered on Sapience or wisdom. An opening passage explains why the narrator is in need of wisdom in all its forms. He has allowed himself to succumb to the vices of childishness and ignorance. The consequences of this are explained in an allegory, played out on an eschekkere, a chessboard ‘in my mynd’ (scroll down for text and translation). (The marginal decoration above is from Bodleian Library MS Laud Misc 751). He contemplates his mental chessboard, uncertain as to how to begin his game. He wants to move his king first, but knows he isn’t allowed to do this under the rules of chess, so gives up because he does not have the skill to move all of the pieces (each of which represent some part of society and worldly authority). Then chess allows him to express his despair: whatever move he makes, he is defeated by daily life and by reversals of fortune. Finally, Reason appears to tell him what a fool he is for playing this kind of game (and so the narrator begins his search for Wisdom). It’s a lively allegory, precise in its use of chess and its rules and language. 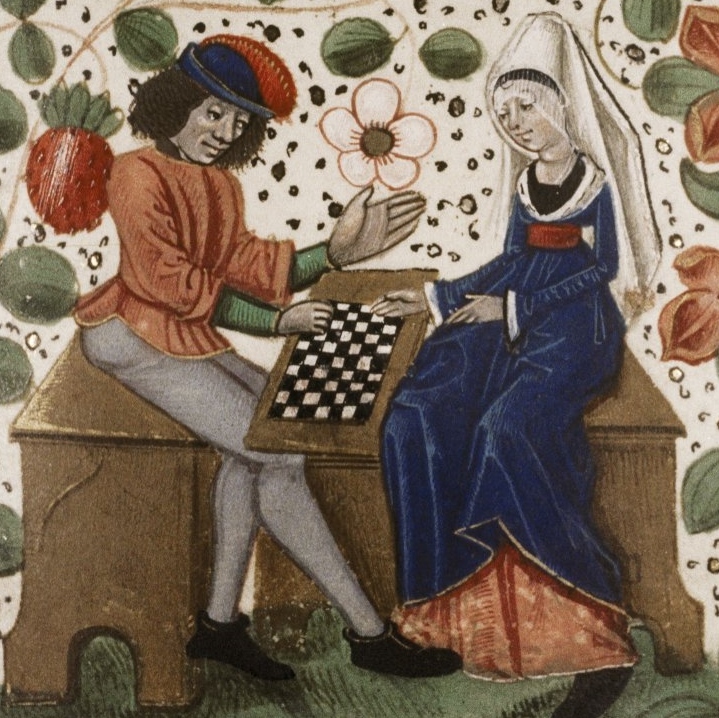 Chess is often used allegorically in medieval love visions (most famously in Chaucer’s Book of the Duchess). But it can also be a way of talking about politics (as Jenny Adams’ recent book explains). The register of chess in English has useful puns for vernacular poets: drawen can mean both ‘to move’ and ‘to depict’, draught can mean both ‘a move’ and ‘a line, a piece of writing’. So the narrator might also like to write about or for his king first, but cannot, because of the king’s limited moves and the complexities and vicissitudes of society and secular authority. The narrator’s self-declared childishness, ignorance and despair echo the Prologue of the Privy Seal clerk Thomas Hoccleve’s 1411 Regiment of Princes (which also uses chess language in this punning way as it refers to its own creation and to one of its sources, Jacobus de Cessolis’s Liber de moribus hominum et officiis nobilium ac popularium super ludo scachorum, translated by William Caxton as The Game and Playe of the Chesse). I was surprised to find echoes of a political poem in this didactic allegory. But perhaps, given the political disorder of the middle of the fifteenth century, when Henry VI was first mentally incapacitated, then rebelled against, deposed and imprisoned, it is not so surprising that a search for Wisdom begins with a chess allegory like this. Echone of these he hath in remembraunce. But I ne wyst what draught was best to drawe. That, or I wyst, sodeynly I was mate. With any man to countre them at chesse? For in theyr draught al deceyte is include.